We all play a vital role in creating strong and thriving families. Join FireLodge Children and Family Services in recognizing April as National Child Abuse Prevention Month. Families can be incredibly diverse in structure and size, but in order for children to grow, it is absolutely necessary that a family be both healthy and able to support one another. With the proper knowledge, skills and resources, a family is responsibly able to parent their children. FireLodge Children and Family Services offers culturally sensitive assistance to Native families experiencing or at risk of child abuse or neglect. Home-based services, parenting skills, budgeting classes, referrals and resources are a sample of the assistance FireLodge offers. When children live through a negative experience, such as abuse or neglect, they become far more likely to face difficulties across their lifespan. Acknowledging this serves as motivation to advocate for a violence-free childhood for every child. Properly understanding an issue is key and fundamental when desiring to make serious change. Consequently, there are several myths that exist surrounding child abuse that need to be expelled. One that is widely believed is that abuse is only considered abuse if it is violent. Physical abuse is one form of abuse but is not the only form. Emotional abuse, sexual abuse and child neglect are forms of abuse that might be more difficult to see physically but can still leave long-lasting effects in children. A second myth is that abuse does not happen in “good” families. The truth is that abuse and neglect do not discriminate; they do not only happen in bad neighborhoods or within low-income families. It is not shameful to receive needed services. It takes vulnerability and bravery to understand a need and reach out for help. Oklahoma children make up nearly one quarter of our state’s population but are our entire future. This month, we encourage you to commit to taking one action to prevent child abuse to ensure a healthy future for our little ones. Join us in raising awareness and giving a voice to children who might not otherwise have one. 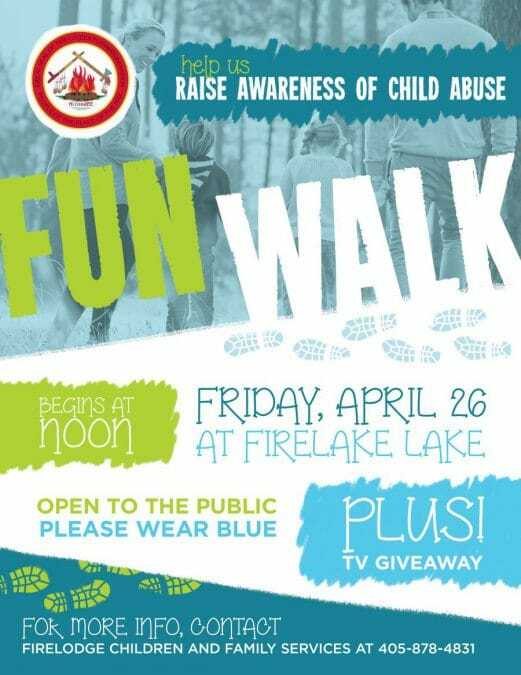 Participate in our fun walk at FireLake Lake on Friday, April 26, at noon. Also, keep an eye out for blue ribbons and pinwheels representing the bright future that all children deserve, and follow us on Facebook, @CPNFireLodge. If your family or a family you know has Native children who are experiencing or at risk of experiencing abuse and neglect, please contact FireLodge Children and Family Services at 405-878-4831.